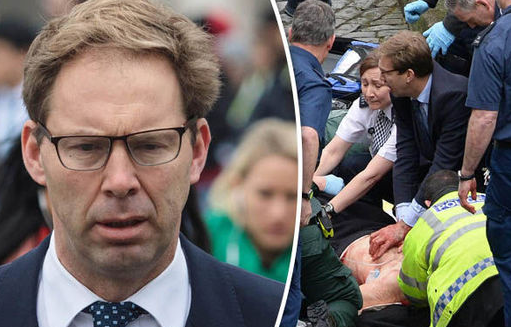 By Felicity Arbuthnot – The attack outside and inside London’s Westminster Parliament just before 4 pm local time on Wednesday 22nd March resulted in five deaths, including the assailant and forty injured. 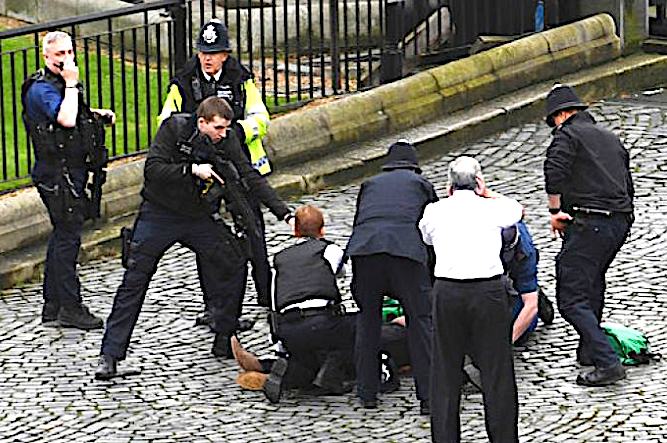 The confirmed British-born attacker, Adrian Elms – but with a number of alias’ including the much quoted Khalid Masood – drove a grey Hyundai SUV over Westminster Bridge, which spans the River Thames as it flows past Parliament, mounting the pavement and mowing down pedestrians crossing the great span, with it’s panoramic city views. “Theresa May, the Prime Minister, was rushed into a car 40 yards from the gates outside Parliament where shots were fired minutes after the incident occurred, according to footage filmed by a member of staff. She concluded: “ Any attempt to defeat those values through violence and terror is doomed to failure. A friend also commented succinctly: ‘If “terrorists will not succeed” in the UK and other Western countries, why should the West expect the Syrian government and its allies to allow the Western, Israeli backed terrorists or other regional actors to succeed in Syria and seize control of the country after six years of global terror?’ Terrorists from up to ninety countries gaining access via the borders left open by the occupiers of Iraq from the time of the 2003 invasion and via NATO ally Turkey’s borders and blind eyes. They say we are all born equal. But only the (Western deemed) “worthy” die as humans. The others are simply forgotten. After last Wednesday’s attack Romanian architect Andreea Cristea was pulled from the Thames, alive but badly injured, it is uncertain whether she jumped to escape the car or fell off in the chaos. Felicity Arbuthnot is a British freelance journalist who has visited Iraq dozens of times since the 1991 Gulf War. She has written and broadcast widely on Iraq, one of the few journalists to cover Iraq extensively even in the mid-1990’s during the sanctions and reporting on the devastating effects that took place prior to America’s attack that killed over one million civilians.